Only applies the style class. If only the style class is applied, individual adjustments, which have already been defined, are not changed. Only applies the individual adjustments. If only the individual adjustments is applied, the style class, which has already been defined, is not changed. 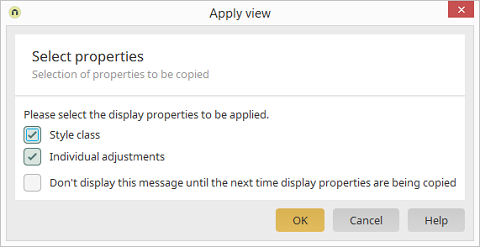 If you would like to apply the same view to multiple controls, activate this setting here so that this dialog is not shown when you apply the view - this setting applies until you copy the view of a different control.